I’ve mentioned several games as being Ys clones in this game. I think as a definition article, I should define what I mean. Makai Hakkenden shows a typical YS clone. Ys, the original one, was a fairly basic action RPG. You bumped enemies at a slight angle to cause damage. 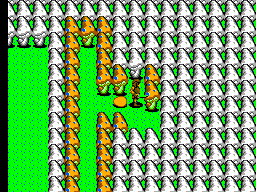 Areas were blocked off by plot and by enemy difficulty. Levels and gear were very important for increasing your strength. 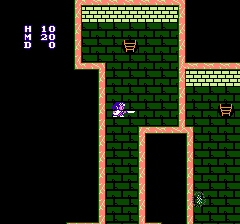 Dragon Crystal, shown here, is a randomized dungeon crawl. However, it uses a "bump the enemy" fighting system. Zelda, in comparison to Ys, tends to have a more room by room structure in dungeons. Ys tends to have maze like dungeons that are explored smoothly moving from area to area. Ys does not have a dungeon map (usually) unlike Zelda. 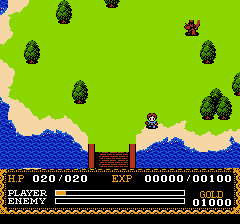 Zelda has respawning enemies on the overworld, but usually limited enemies in dungeons. Ys tends to have respawning enemies in most areas. The perspective of Zelda and Ys are often similar, but Zelda has favored timing weapon strikes versus the “bump the enemy” system of the early Ys games. Zelda also tends to use tools to explore, and the early games tended to just have them used like keys to bypass areas. Elysion has a sword swing, unlike the bumping mechanic, but it does use the maze style dungeon like Ys. It also has enemy facing taken into consideration for damage. A good early Ys clone ideally doesn’t have a lot of grinding to advance (though the original game does have a lot of grinding.) It should be fairly easy to bump and enemy without being hurt. Since you have to explore large areas, good music is a benefit. 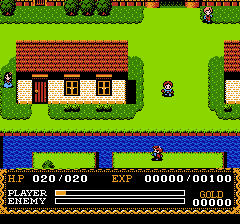 The first town in the NES port of the first Ys game. The red haired man in blue is the hero. What’s the appeal of Ys? It’s a game that gives you a large curve of power, so while you start out weak, you do feel pretty strong by the game. There are fairly interesting tactics (especially in the later games) which can reward you with faster progression in the game. Most games have superb music. While you to have to do grinding to progress, you are allowed to get to the grinding fairly quickly. 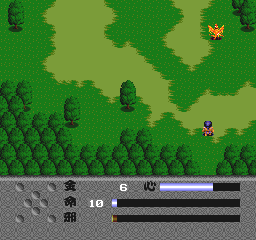 This shows the typical battle field in the first Ys game. The red golem like creature is an enemy, and past the bridge is the first town.